Coca-Cola China is running “Gold Moments”, an advertising campaign promoting the company’s global sponsorship of the Rio Olympics. The campaign features two films that will run on both on TV and on digital platforms. The first, POV, reveals a vulnerable side to China’s Olympics heroes while also honoring their greatness. The second, Anthem, features ordinary people from different ages and backgrounds experiencing gold moments with their supporters. 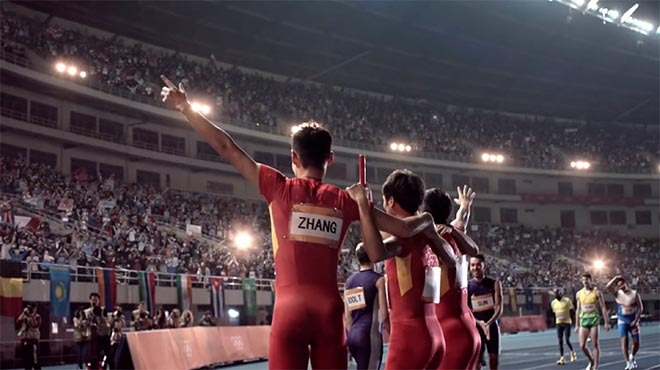 The China Olympic Campaign of Coca-Cola will consist of three phases where Gold Moments will also be amplified on digital, including one of their largest ever social campaigns partnering SNS Qzone with more than 640 million users. Sun Yang won the 400 m and 1500 m freestyle at the 2012 London Olympics, becoming the first Chinese male athlete ever to win an Olympic gold medal in swimming. Zhu Ting is the 2015 World Cup’s most valuable female Volley Ball Player. Lang Ping is known as the Iron Hammer to all Chinese and the most famous Chinese Volleyball coach. The 4 x 100m track & field team won gold in the recent International Diamond League race and a Silver medal in the World Track and Field Championships in 2015. Featured in the second spot is Lang Lang, one of China’s most famous pianists and world renowned as one of the greatest classical musicians. He is featured with his 87-year-old piano teacher Yafen Zhu who he cherishes and has always been there for him since he was 3. The Gold Moments campaign was developed at McCann Worldgroup China, by creative directors Akshay Kapnadak, Tomaz Mok, Jeremy Guo, Hesky Lu, creative planners Jitender Dabas, Jay Caplan, agency producer Alison Lin, account team Star Zhou, Sophia Guo working with Coca-Cola Asia Pacific account heads Prasoon Joshi and Cia Hatzi. POV was filmed by director Augusto Fraga via Cases Films, Shanghai, with director of photography Sergi Gallardo. Anthem was filmed by director (Yujie) Louis Shen via Mili Films, Shanghai, and 16:9 Films, Shanghai, with cinematography by Liang Zi, Shiping Su, and Yunfeng Zhang. Music was composed and performed by Lang Lang, orchestrated by Yilin Zhang.